Armed with a “robust” computational approach that stretches the amount of time needed to capture the gyrations of proteins in their natural state, a research team has revealed for the first time intricate details about how a key molecular switch, implicated in a variety of medical conditions including heart disease, is turned on and off. Specifically, the study – published in the March 5 online edition of the Proceedings of the National Academy of Sciences (PNAS) – describes how the supercomputing power of Gordon, Comet, and GPU clusters, all based at the San Diego Supercomputer Center at UC San Diego, were used with improved accelerated molecular dynamics (aMD) or Gaussian aMD (GaMD) to simulate the merger of a G-protein “mimetic nanobody” to a G-protein-coupled receptor (GPCR), the largest and most diverse group of membrane receptors in animals, plants, fungi, and protozoa. Nanobodies are diminutive versions of the active site of antibodies, created with the goal of binding to challenging proteins, such as receptors that work on oily cell membranes. The nanobody mimics the GPCR binding activity of a “G-protein”, which carries the message of GPCR activation further into the cell. For the current study, the researchers used a nanobody that’s proven -- via a static X-ray image -- to be capable of binding to a M2 muscarinic acetylcholine receptor (or M2 mAChR), a molecular switch located on cell membranes that plays a key role in heart rate and contractions. The reason? The genetic sequence of the M2 mAChR’s primary ‘orthosteric’ binding site is ‘highly conserved’. “They’re found in least four other receptor types that are widely spread in the body, and when drugs accidently bind to these other receptors, unwanted and sometimes serious consequences may result,” Miao said. For this reason, drug designers have been seeking safer drug alternatives. One approach is homing in on molecular targets or so-called “allosteric binding sites” that reside away from the receptor’s primary binding site and are built around a more diverse genetic sequence than their counterpart “orthosteric” binding sites. Essentially, allosteric modulators act as a kind of cellular dimmer-switch that, once turned on, ‘fine tunes’ the activation and pharmacological profile of the target receptor. In particular, drug designers have begun to aggressively search for allosteric modulators to fine-tune medications that bind to GPCRs. These GPCRs act like an inbox for messages in the form of light energy, hormones and neurotransmitters and perform an incredible array of functions in the human body. But finding molecules that bind to the allosteric sites, using conventional molecular dynamics approaches, has proven extremely challenging, stemming from the limited amount of time offered by conventional molecular dynamics. The improved computational approach in this study, developed by Miao and McCammon, overcomes some of this time barrier. As described in the PNAS study called “Mechanism of the G-Protein Mimetic Nanobody Binding to a Muscarinic G-Protein-Coupled Receptor,” the relatively lengthy simulations, about 4,500 nanoseconds, captured the millisecond timescale movements of the nanobody as it passed though assorted pathways and intermediate states toward its target M2 receptor. The previous simulation record was between 400 to 500 nanoseconds for systems of similar size. 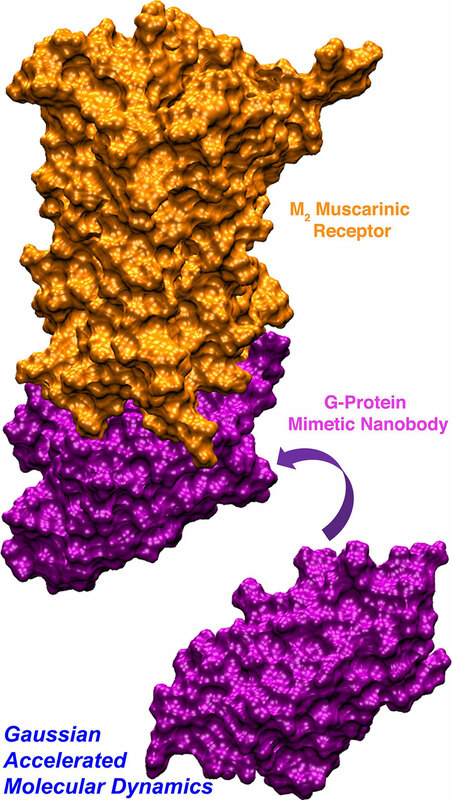 Detailed analysis, provided by Gordon and Comet supercomputers at SDSC, showed the nanobody first contacting the receptor from its inward-facing or intracellular side, triggering changes in the diminutive protein’s conformation so it would fit neatly into the target G-protein coupling site of the M2 receptor. Once bound, the outward-facing or orthosteric pocket of the receptor – the primary target for small molecules like drugs – was shown to switch from its open to closed state. Miao said the researchers plan to further improve methods for simulating larger and complete G proteins that bind to CPCRs, and other functionally important protein-protein interactions. “We are indeed trying to improve our method to simulate GPCR-G protein binding processes together with potential advances in computing power,” he said. Allocations for SDSC supercomputers were provided by the National Science Foundation-funded Extreme Science and Engineering Discovery Environment (XSEDE), one of the most advanced collections of integrated digital resources and services in the world. Funding for this research was provided by grants from the National Science Foundation (grant MCB 1020765), National Institutes of Health (grant GM31749), Howard Hughes Medical Institute, National Biomedical Computational Resource (NBCR), the American Heart Association (award 175DG33370094), and start-up funding from the University of Kansas College of Liberal Arts and Sciences. Additional computing time was provided by the Edison and Cori supercomputers through the National Energy Research Scientific Computing Center Project.